Would you like instant access to thousands of movies, premium TV channels, and pay-per-view content for a low monthly subscription fee, or even for free? These are two examples of the promises that providers of Internet Protocol Television (IPTV) make to consumers to entice them to purchase their products. However, merchants who offer unauthorized IPTV services can lead to big fines for payment processors. IPTV is a service that enables consumers to access television via the internet. These services, both legitimate and illicit, have risen in popularity in recent years as more consumers gain access to high-speed internet and desire cheaper, à la carte alternatives to traditional cable TV providers. Typically, IPTV providers offer subscription access to streaming content, or provide devices that are pre-loaded with applications intended for the same use. The relatively quick adoption of IPTV has made it a prime target for criminals. Piracy has risen in conjunction with the popularity of IPTV services, often at great cost to rights holders. The 2017 Notorious Markets List, published by the United States Trade Representative, estimated that unlicensed video providers, hosting services, and device sellers stood to bring in $840 million a year in revenue from the sales of their products. According to the report, the cost to the entertainment industry is estimated to be between $4 billion and $5 billion. While IPTV providers have long argued that they are not violating the law because they only provide access to streaming content, and are not offering downloads or hosting any content themselves, courts disagree. The European Court of Justice ruled that fully loaded IPTV devices are illegal, and sellers of these devices have found themselves on the receiving end of large fines, £250,000 (about $350,000) in the case of a UK man offering fully loaded IPTV boxes. Rights holders are also fighting back against piracy, and payment processors can be left on the hook for sizable fines associated with processing payments for these merchants. Both Visa and Mastercard prohibit illegal transactions involving copyright infringement, and work diligently with rights holders to investigate allegations of infringing behavior. Downstream processors and ISOs may find themselves facing repeated fines if they allow illicit IPTV services to remain on their platforms. However, many of these services present themselves as legitimate, making it challenging to distinguish them from legal IPTV services. What are some signs an IPTV merchant is operating illegally? 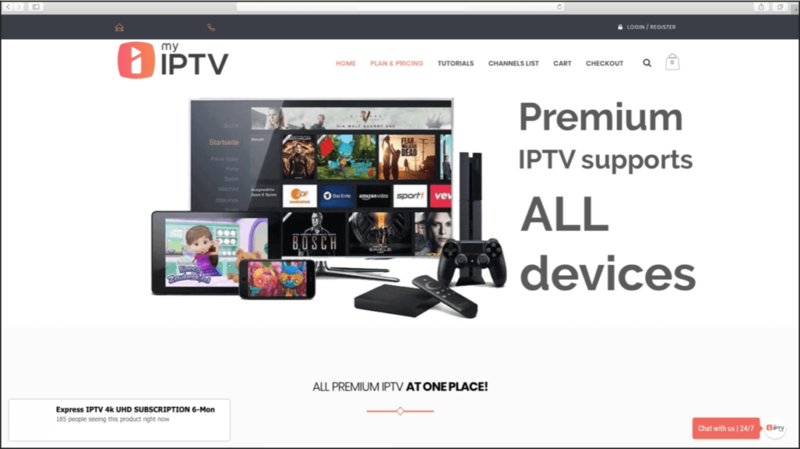 This IPTV merchant may look legitimate, but promises of more than 3,300 channels, including many international channels and premium services such as HBO, should raise red flags. LegitScript combines technology with human expertise to proactively monitor portfolios for problematic merchants. We alert payment facilitators if their merchants are offering IPTV products or services that pose a risk for copyright infringement, thereby helping these companies avoid regulatory scrutiny and card brand fines. Additionally, we monitor more than 500,000 merchants (and counting! ), with a comprehensive database of known bad actors. IPTV is growing steadily more popular as streaming content increases. While enforcement efforts against copyright infringement ramped up in 2017, criminals will continue to circumvent law enforcement efforts by clustering in jurisdictions where copyright enforcement is lacking. Are you a payment processor struggling to keep these merchants off your platform? Contact us to explore our merchant monitoring service offerings.